Includes: Head scarf, shirt with attached vest and pants with attached boot tops. Size: STANDARD (fits up to 44 jacket size). This type of costume might represent a sailor who has sufficient wealth for fancy golden-looking pants and leather-looking vest. 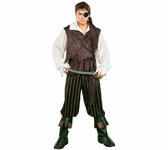 A pirate wearing similar garb would command respect on any pirate vessel.